When working on car and truck painting tasks, the Wagner MotoCoat Sprayer is an ideal option for you. With various nozzle options and the X-Boost Turbine, you are going to achieve an amazing finish that looks professional. The 39-feet of the high-flex hose will also allow you complete maneuverability around your vehicle while painting. When looking at comparable models, many of the other sprayers had hoses about 15-feet shorter! This hose is also serrated, so each section of the hose is going to work independently which allows for much more flexibility. Thanks to Wagner’s technology, the spray attachments will easily separate from the gun for quick clean-up and color changes. This self-contained sprayer also features a spark-contained motor for additional safety. The Motocoat paint sprayer also weighs just less than 9 pounds. This means you can easily move it around your shop wherever it is needed. 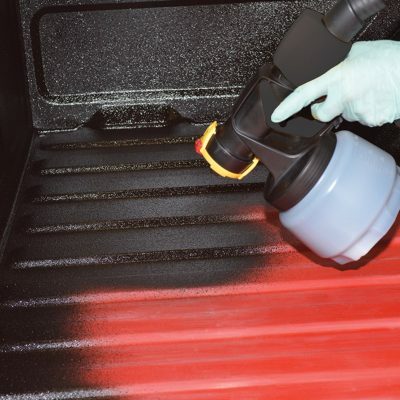 This sprayer offers a great opportunity to save money on your auto painting jobs. Instead of hiring a professional, why not do it yourself? Doing a job on your own means you have complete control over the outcome. Designed for the DIY auto enthusiasts and professional installers, the Wagner MotoCoat spray will allow you to safely apply most low flash-point coatings. This includes protective materials and customized coatings. You’ll find it handy for spraying everything from heavy truck bed coatings to undercoating. In addition, light materials such as rubberized, peelable coatings and auto finishing paints can be quickly applied. The iSpray Nozzle and cup attachment is capable of spraying protective coatings which will create a thick coating and textured finish. The Detail Finish Nozzle and cup attachment are capable of spraying the thinner materials for an even coverage and smooth finish. Between the two, all auto enthusiasts will be able to create the perfect look on any vehicle. If you are a beginner at auto painting, this would be a great sprayer to learn from but is geared more towards the experienced painter. Either way, you’ll want to practice on a piece of scrap to ensure that the flow and paint are coming out the way you desire. 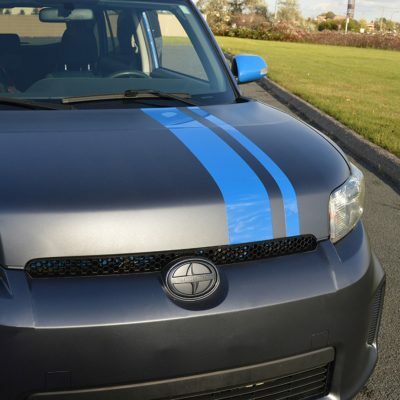 You’ll also want to ensure that you are using proper painting techniques prior to working on your vehicle. A little practice now can save you costly repairs later. This unit is a portable system that can apply various coatings without the need for additional equipment. You don’t need an air compressor, various pistols or anything else to operate this sprayer. Getting started with the Wagner MotoCoat Sprayer doesn’t take long. There are 6 simple steps before you get moving. Insert your suction tube into the intake opening. Align the tube properly – forward for downward directions, backward for upward directions. Screw the cup onto the spray gun assembly and tighten. Align the arrow on the spray gun and twist the spray gun into the handle until it locks. Insert the air hose into the spray handle. Insert the air hose into the turbine. Now, you’ll just need to prepare your materials and practice painting. The X-Boost Turbine will provide you with superior atomization and the portable power you need to paint anywhere. This HVLP technology gives you the desired finish with maximum control. The performance is going to depend largely on a variety of factors: material thickness, volume, air pressure and the spray pattern you select. It will take a little trial and error until you figure out the right spray for your needs. There are several setting adjustments that can be made on this sprayer. The first is with the Air Pressure Control Selector. This dial allows you to adjust the level of air pressure that is produced by the turbine. When you use a high air pressure level, you can expect a smooth finish. When you choose a low air pressure level, you can expect a rougher finish. The “0” is the off setting while “1” is for your thinnest materials. Use the “2” when you have thicker materials. The Material Flow Adjustment is in charge of controlling the spray material coming from the spray gun. For the thicker materials, you’ll want to start with the highest flow setting and then gradually decrease until you’ve found the right one. When painting with thin materials, be sure to start on the lowest setting and slowly work your way up. You can also adjust the spray pattern shape by turning the adjustment ring on the iSpray nozzle or the air cap ears on the Detail Finish nozzle. You will be able to choose vertical spray, horizontal spray or round. The unit comes with the two nozzles for the ultimate in versatility during your auto projects. The iSpray Nozzle is ideal for spraying protective coatings which will create a thick coating and textured finish. The Detail Finish Nozzle is perfect for spraying the thinner materials for an even coverage and smooth finish. Cleaning your sprayer is important to do each time you are finished using it. Unplug the power cord and loosen the container just enough to relieve the pressure. Then, pull the trigger to return leftover material back into the cup. Unscrew and remove your container. Empty what is left back into the original bucket. Use the appropriate cleaning solution, either warm soapy water for latex paints or mineral spirits for oil-based paints. Reattach the cup and spray while gently shaking to break up smaller particles. Again, unplug the unit and loosen the container to release pressure. Pull the trigger to release materials and then empty the contents of the container. You will also need to thoroughly clean the various components of the sprayer including the two nozzles, nozzle seal and adjustment ring with the appropriate cleaning brush. You can also clean the air vent with the suction tube and a soft-bristled cleaning brush. End your cleaning by applying a small layer of petroleum jelly on the O-ring. If you are looking for one of the best automotive sprayers, the Wagner MotoCoat Sprayer is a great tool to help you complete your jobs quickly and efficiently. If you need to spray something besides an automobile then check out our guide here. You’ll find it creates a professional finish in a fraction of the time of other models.